… no, I’m not getting married. 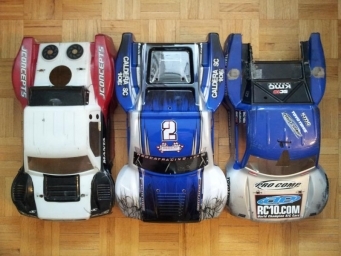 After getting back into Radio Control last summer I had only been buying used RC cars, since there were some great values out there. 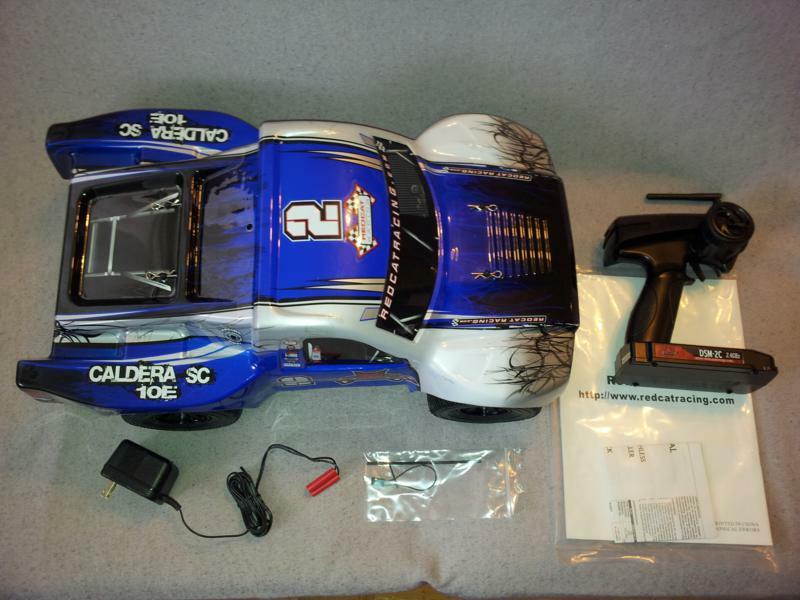 But I wanted to try something different: back when I first played with these cars in my teens Traxxas was the new-kid-on-the-block… these days Redcat is one of the underdogs – so I decided to give them a try!. The Canadian distributor that’s doing the most to grow the Redcat market is Amazing RC store, about 30 minutes away from me, so I emailed in an order and picked up a new toy on Friday. 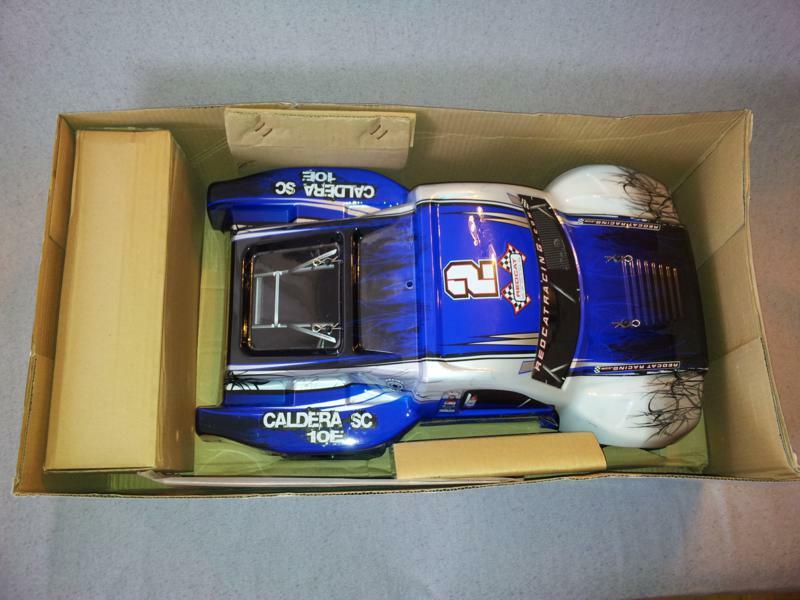 A Caldera SC 10E. 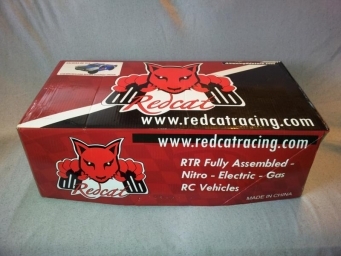 The box showed generic Redcat branding, with stickers to show the model and Amazing RC Store as the distributor. 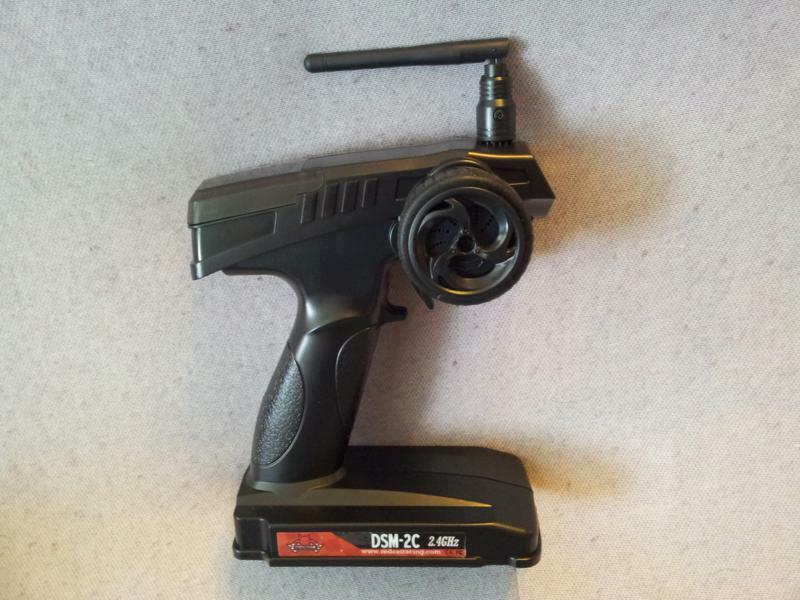 The transmitter and receiver are rebranded FlySky GT2 2.4GHz systems (usually purchased here or here). I’ve owned one of these before: a sturdy radio with range farther than you can see to drive (Google for reviews). I’d say they’re second in value only to the FlySky GT3B… since you get quite a bit more features with the GT3B for only $10-$15 more. The GT2 gives you standard servo reversing, trim on both channels, and steering dual-rate (which became important later). 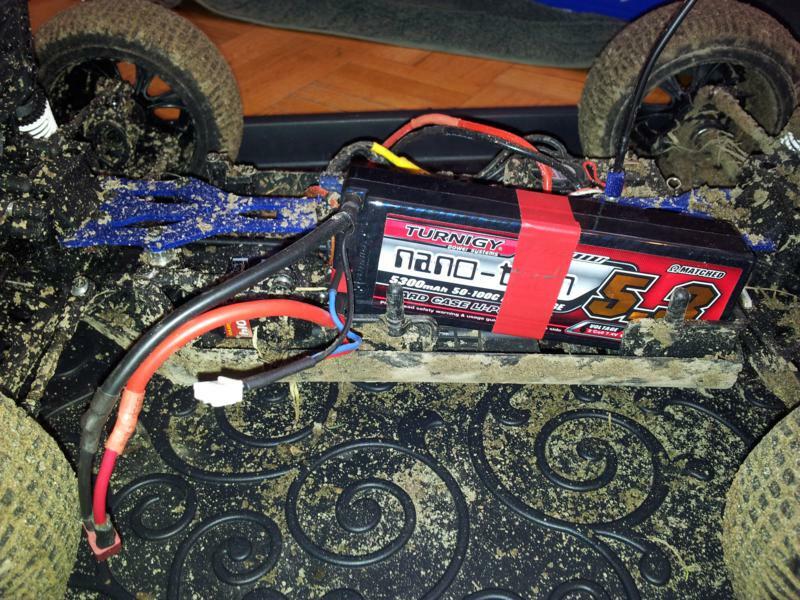 Under the cover it looked pretty much like I expected from reading the online sales page: 380-rotor-in-finned-540-can 3570kv brushless motor with a small HobbyWing ESC, 3800mah NiMH battery with bullet connectors, and a 3kg servo. It also came with a trickle wall charger with bullet connectors… but I decided to use my existing quickcharger instead. 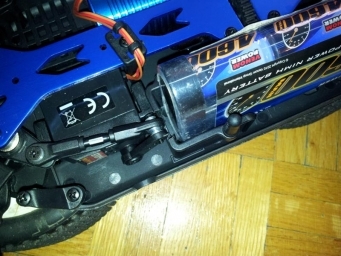 The 4mm battery connectors had to go: the rest of the RC universe is using Deans or Traxxas connectors: I soldered on Deans before I drove 5 feet. 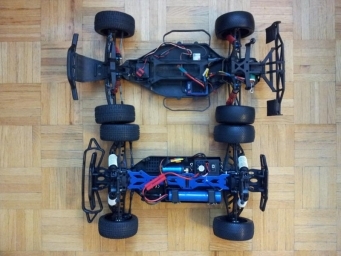 The body is thick yet flexible: in fact it’s more flexible than either of my SC10 bodies. 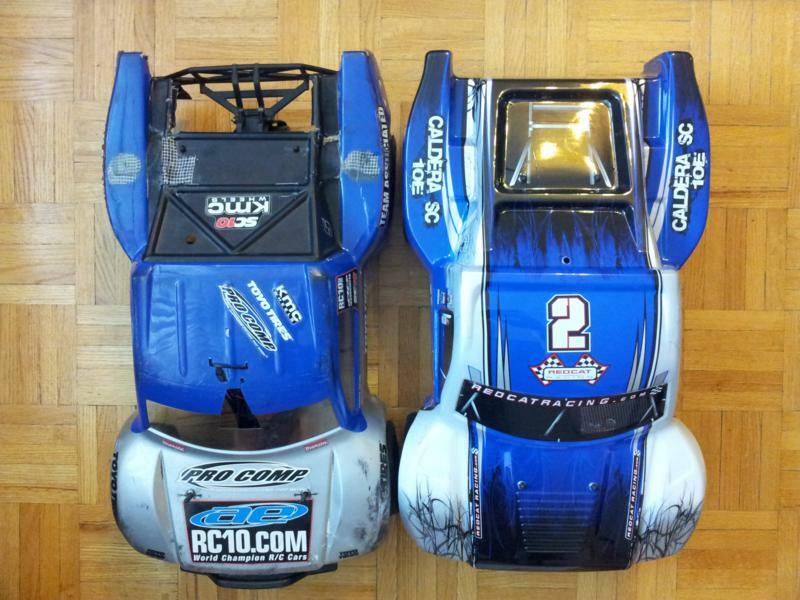 I can’t tell if the SC10 bodies are thicker, or if they’re just a harder blend of Lexan. The front and rear have identical main bumpers, but the front has a second much more pliable bumper as well. It was soft enough you could bend it back to the primary by pushing on it firmly: it felt like it would act as an effective crumple zone in any crash. The main bumpers are a bit worrisome: they’re made of extremely firm plastic… I tried to bend them by hand and I think they would crack before bending. We’ll see how they hold up. 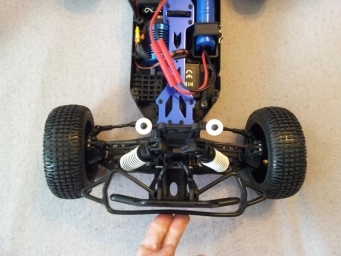 If you were going to take this model to a track to see if you liked beginner racing you could mount a secondary bumper on the rear as well: since SC trucks tend to “parachute” and land rear-first, and you’re more likely to get hit from behind when driving with others: for solo bashing you wouldn’t need it. I also noticed it didn’t have any side bumpers – I’ve never taken any hard side hits with my SC10, but side-bumpers are a staple of every other Short Course truck out there… so I don’t know if that will be a problem or not. 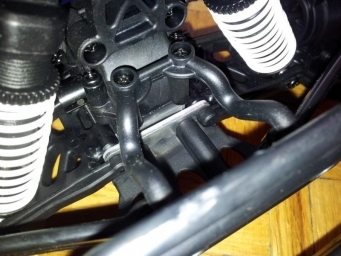 The suspension has all the adjustability you could want: shock position top and bottom, camber-arm position inside and out, threaded-body “big bore” plastic shocks etc. Steering and camber arms are all metal turnbuckles: no fixed-length plastic links. The stock springs seem OK, maybe a tiny bit soft… but the stock dampening is much too firm: like they used honey for shock oil. You can push the chassis to the ground and let go… and almost count to two as the springs struggle to raise it back up again. I’ll replace the stock oil with 40wt… and if that’s not an improvement I’ll drill another hole in the pistons. You may be able to adjust rear toe and anti-squat, but I haven’t looked into it yet. As for travel, the arms can move through their full arc without binding the dogbones. I mention this because other off-brand RC’s that are based on an on-road chassis can have the problem of the dogbones bottoming out before the chassis does (Exhibit A). Not a problem on the Caldera SC. One nice touch is that the A-Arms come with ride-height adjustment holes and tabs on the chassis (but no screws included). If you spend a lot of time racing or on flat surfaces the screws let you lower ride height externally (instead of placing internal limiters under your pistons, or buying shorter shafts). There are also mount points for a rear swaybar (purchased separately). 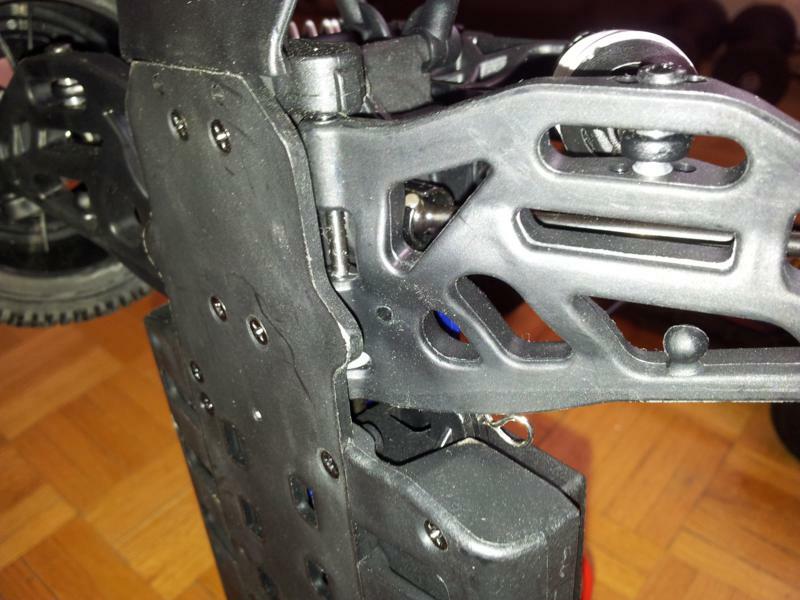 Finally, the front and rear hinge-pin braces are metal. 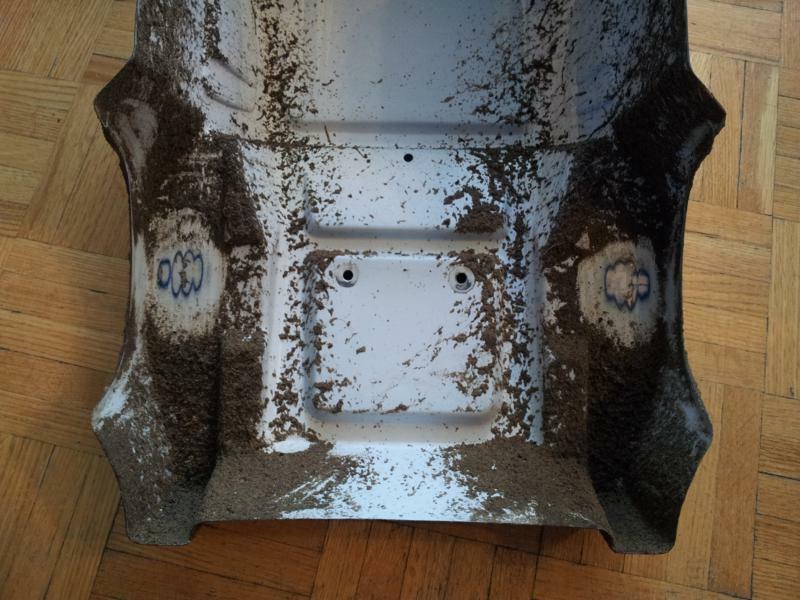 I only mention this because when I started taking my B4 buggy to the track the plastic brace was the weakest point in the whole car. If you’re running on a track that doesn’t have strict width rules for SC trucks (i.e. 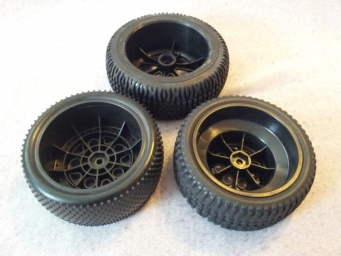 ROAR rules), or if you’re just looking to make your truck a bit wider for stability, the Redcat SC rims will get you a few more mm than Blitz rims, and they’re cheap (about $20 a pair with tires+foams – not sure if you can buy just the rims). 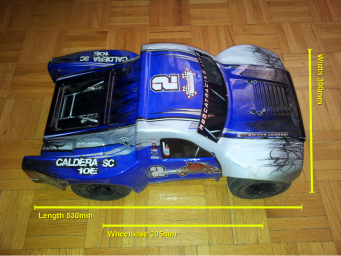 I wanted to compare truck length, since the stats from Redcat can make the Caldera SC sound short: short enough some forum postings suggest it may not be allowed on most tracks. 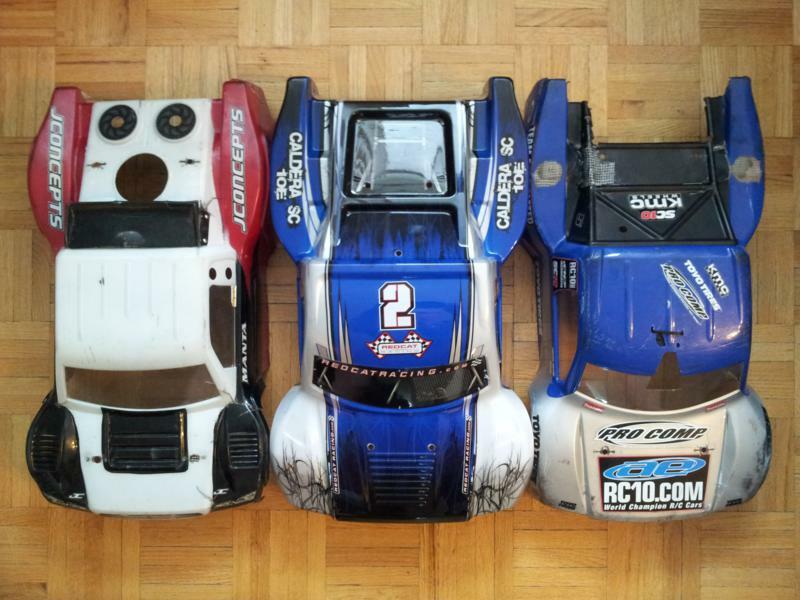 Here’s 3 bodies: SC10 aftermarket on the left, Caldera SC in the middle, and stock SC10 on the right. So far the Redcat looks the same as a regular SC truck. Next, mounted: SC10 on the left and Redcat on the right. Here you can see the RPM bumper on the SC10 stick out the front, and the stock bumper peeks out the back (I cut out the back of the SC10 body due to damage). The Caldera SC is a bit shorter: though it would gain some length back if you mounted the secondary bumper on the rear as well. 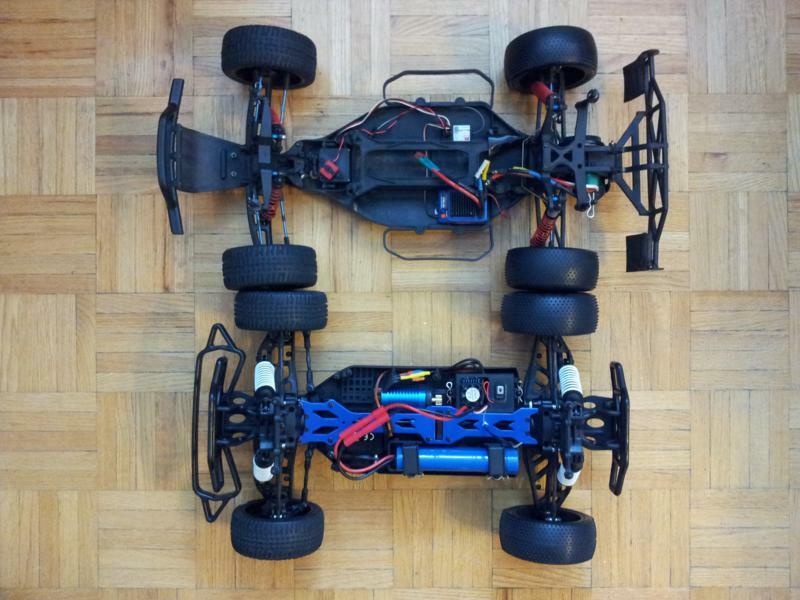 Here they are undressed: SC10 on top and Caldera SC on the bottom. From the front of the front tires to the back of the rear tires they’re almost identical in length because of the taller Redcat tires. 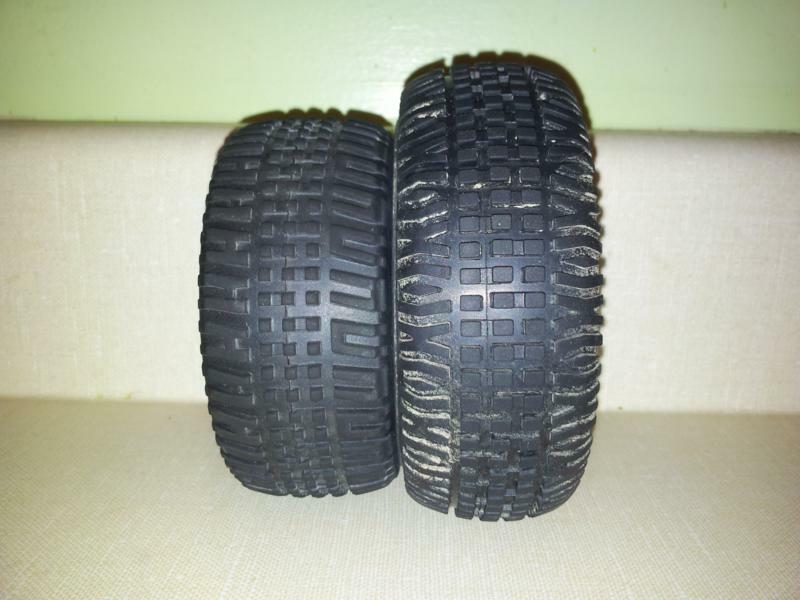 As an apples-to-apples comparison: here’s both with the same rubber (SC10 stock up front, Schumacher mini-pins in back). The SC10 (top) is using the stock SC10 4wd rims, while the Redcat is using HPI Blitz rims. (I didn’t want to remove the stock Redcat rubber yet so I used HPI rims: that means in real life the Caldera SC would be about 6mm wider than in this picture, using its stock rims). The Redcat has about a 1cm shorter wheelbase when you view it like this. A metal antenna mount with a threaded collar to cinch down the plastic antenna tube. 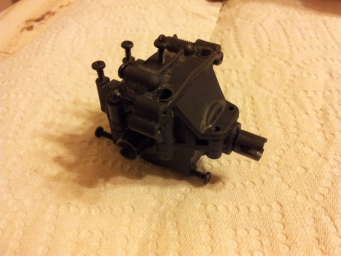 Overall the parts seem to be of quality manufacture: very few pieces had extra flashing showing. The battery holddown mounts are a bit strange: 2 separate pieces held on with body pins… but the pin holes are at different heights for each mount. The battery isn’t held tightly, and the mounts also aren’t held snug with their pins… so if you pick up the truck and shake it the mounts rattle around. 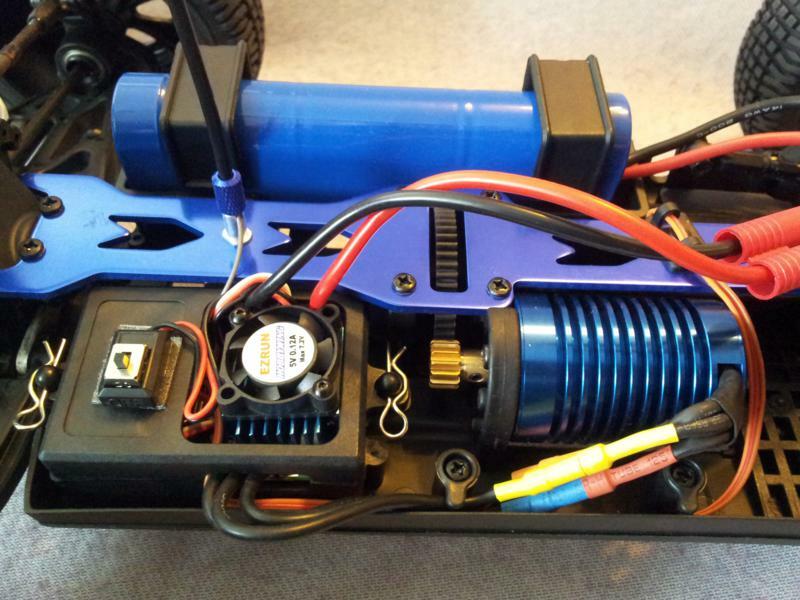 My fix was to wind the battery/ESC wires under each mount to take up some slack. 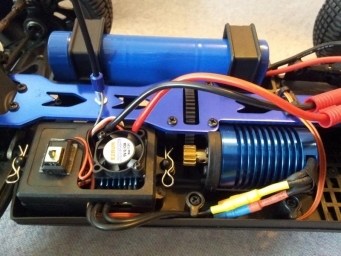 Finally, the chassis is compact and slender… but has little room for extras: the stock HobbyWing ESC just barely fits in the radio tray: anything bigger would probably have to be mounted on top of the center brace. 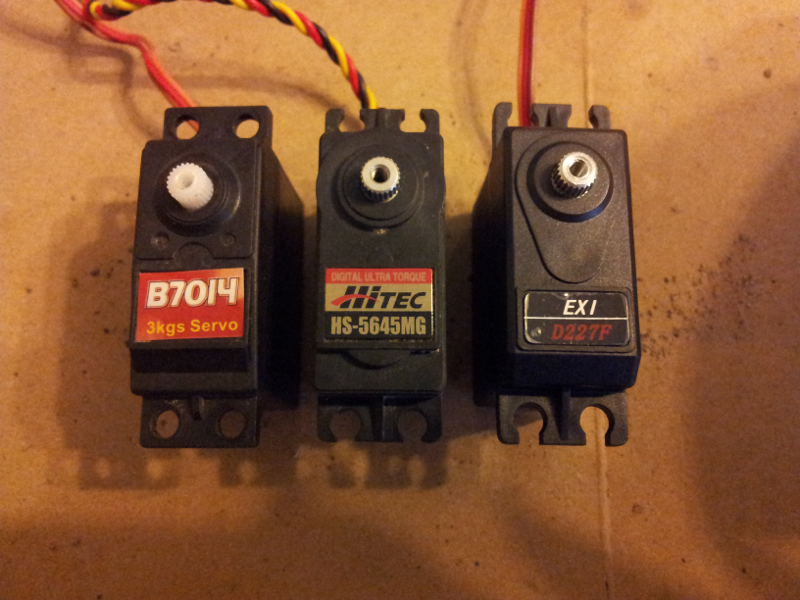 I charged up the stock battery and 2 more of my NiMH’s and took it for a drive. I went to the park near my house where there’s large grass fields and packed dirt walking paths lined with trees on both sides. The radio was pre-bound, the ESC had forward/neutral/reverse correctly set, and the steering trim was almost perfect out-of-the-box. The truck was faster than I had expected: easily faster than any brushed system I had ever run. As for handling… it was fun to drive and it went where I pointed it, though with the thick shock oil it would chatter over rough terrain at speed. Other than a slight wander trying to go straight (see problems below) I never had issues with turning speed or radius, so I think the servo is powerful enough for this truck (it’s strong enough to move against the servo saver if you hold the front wheels stationary). There was a slight bit of oversteer at high speeds where if you gave the steering a weave the back would want to come around. That meant you had to be a bit gentle accelerating for speed runs on pavement, with smooth steering, or you could fishtail… but it was a blast in the dirt. Off-road you would just accelerate… then slightly back off the throttle for a second and turn… and the rear would smoothly slide out in an arc as you poured the power back on. Looked awesome! I’ll try thinner shock oil first to see if it will be more planted on stock tires, then try softer tires. I think the best you could do would be to nibble out a notch on the inside of the battery tray, (facing the driveshaft and top brace). There is about 2cm of clearance, enough for short bullets or 90-degree bullets into a hardcase. 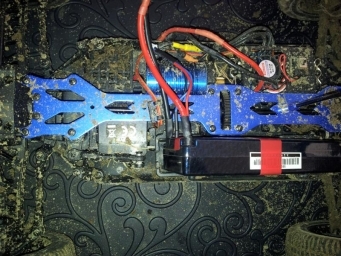 If you’ve got a stack of hard lipos and don’t want to modify the battery tray, this isn’t the truck for you. 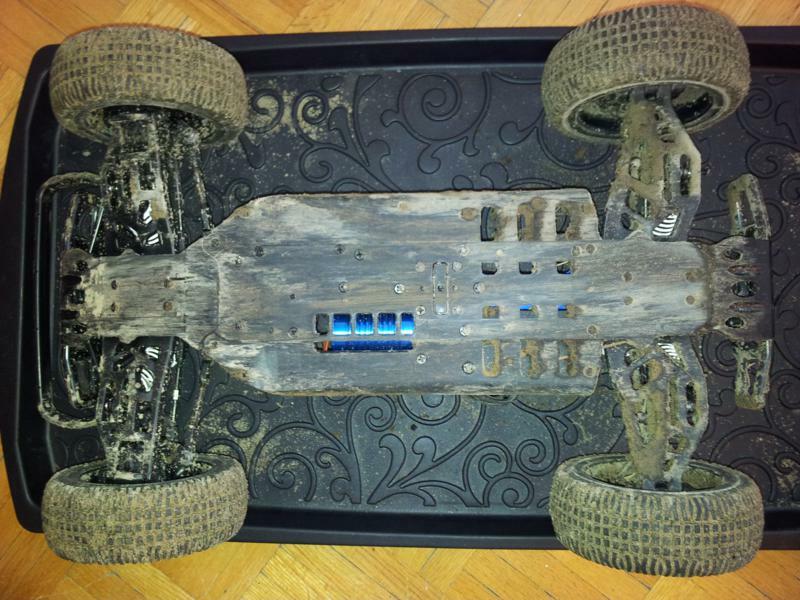 Another thing I noticed after running in the dirt is that the chassis isn’t smooth on the bottom like on most other SC trucks. All the screws are countersunk, but there are cutouts under the motor and where you would mount 6-cell saddle packs in an onroad car (both allowing you to mount those components lower, to lower the center of gravity). But for me it meant any time the chassis bottomed-out the cutouts acted like a dirt cheese-grater, spraying the inside of the chassis with sand: and by the time I came home each hole was half-filled with damp soil. But since I wanted to use the standard tires, I devised a different fix: chop off both outside extensions with a Dremel. Perfect! 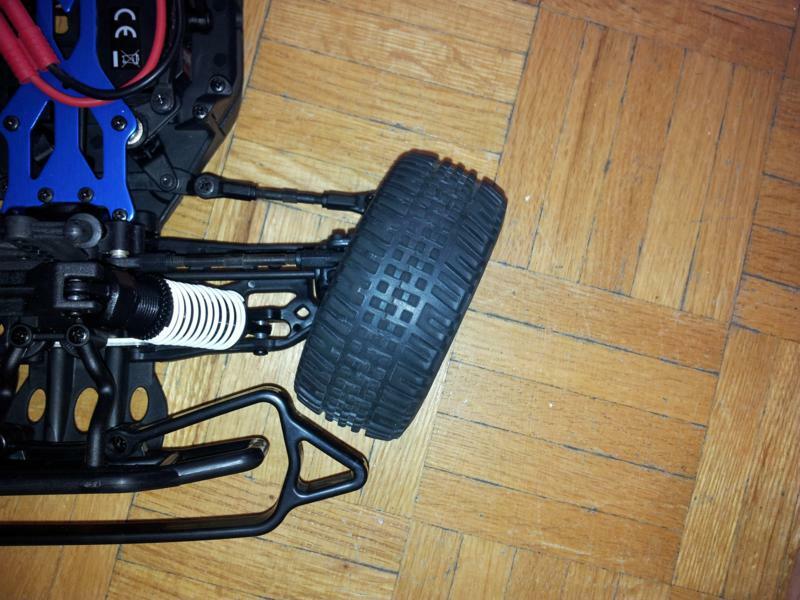 Steering Issue #2: Steering was initially very slow and sluggish. I’ve read other people complain about the servo being too weak… but the problem I found was that the steering rack was binding at the servo saver. There is a machine screw that goes down through the top blue aluminum brace into the top of the servo saver steering post… and if it’s tightened down it adds a lot of friction to the steering. 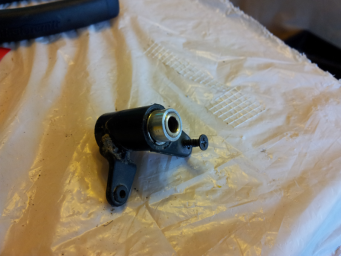 I backed off on that screw just the tiniest bit and the steering moved much more freely. I pinned that screw down with threadlock for now. 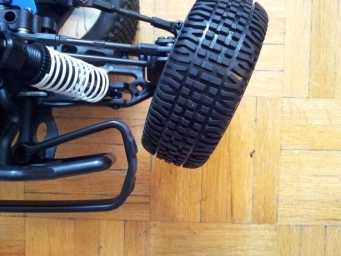 Steering Issue #3: The ball-ends are extremely tight out-of-the-box: they’re tough to move by hand. This is something that I’ll live with for now, since I think they’ll loosen up quickly after a couple of packs. If not, I’ll add a drop of oil and keep them clean. 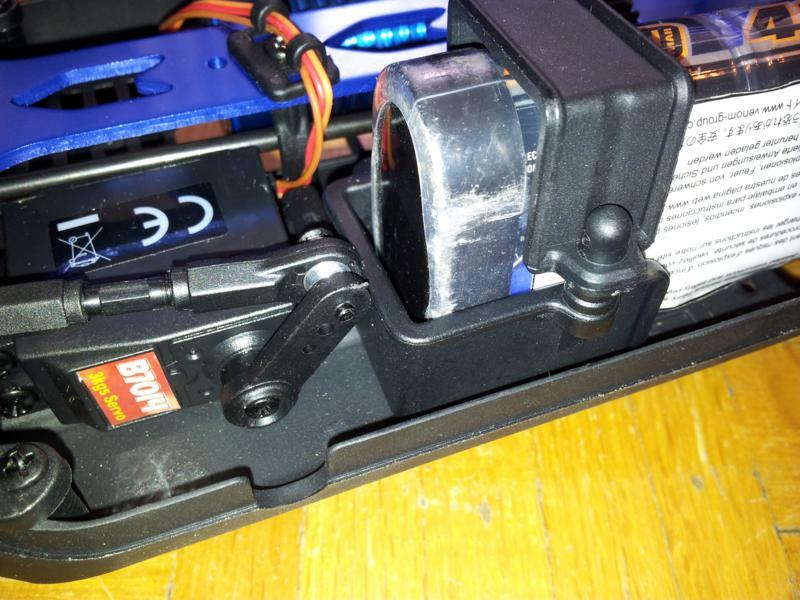 When you disconnect the servo the entire steering assembly should be able to move freely: right now it doesn’t because each ball at the end of each rod is pinched and doesn’t want to spin. Steering Issue #4: The servo had a bit too much throw out-of-the-box: it would pull the inside steering arm tight to full lock, and still try to pull some more. So at full deflection you could hear the servo whine and see it struggle against the servo-saver spring. Solution: dial back the dual-rate a tiny bit from the radio: fixed! 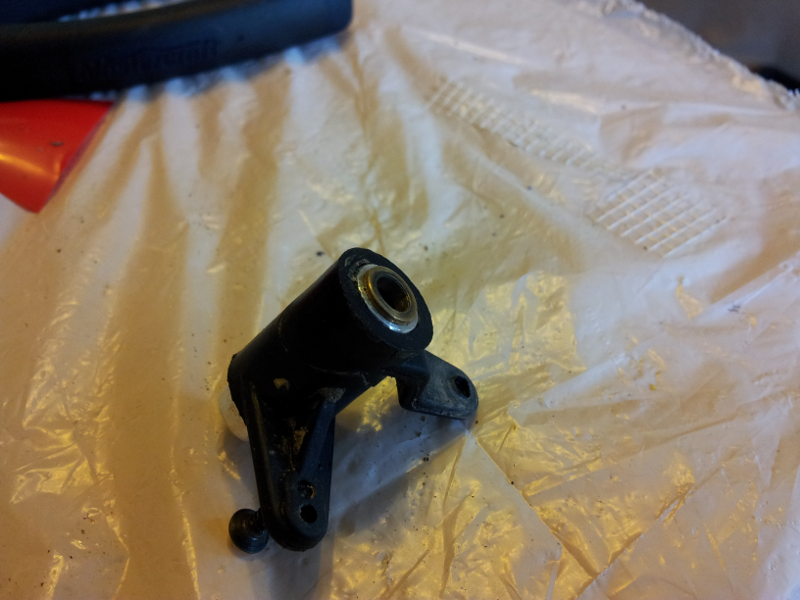 Steering Issue #5: Poor servo centering. When you steered to full lock left or right and let the servo return to the middle of it’s travel… it wouldn’t come back to the same place. I.E. if neutral was at 0-degrees.. and you turned right 45 degrees… when you let go of the steering it would return to about 2-degrees (always returned a bit off-center going left or right). It did this with the wheels off the ground, so I don’t think it’s a servo strength issue. You would notice it when driving when you tried to go straight: you’d always be going almost-straight… veering a tiny bit in the direction you last turned. Maybe playing with toe settings up front would help the servo center better while moving, I haven’t fiddled with it yet. I only noticed it when trying to hold a narrow straight line for a long time at mid/high speed (like following a sidewalk). Steering Issue #6: At about 95% full deflection the servo horn would hit the battery tray… then whine as it hopelessly tried to move that final 5%. The Caldera SC 10E can be found for about $250-$270 Canadian online, all-in, including taxes. 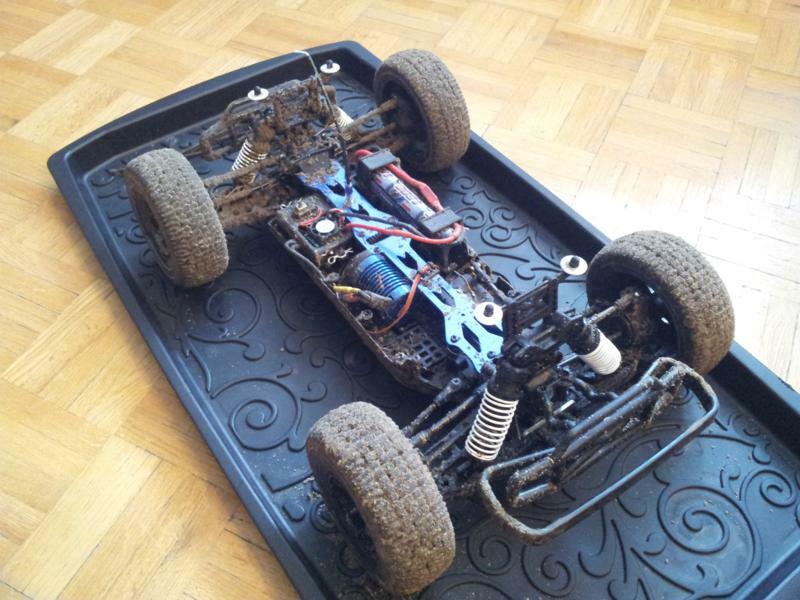 For that you’re getting 4wd, 2.4GHz radio, and brushless electrics. 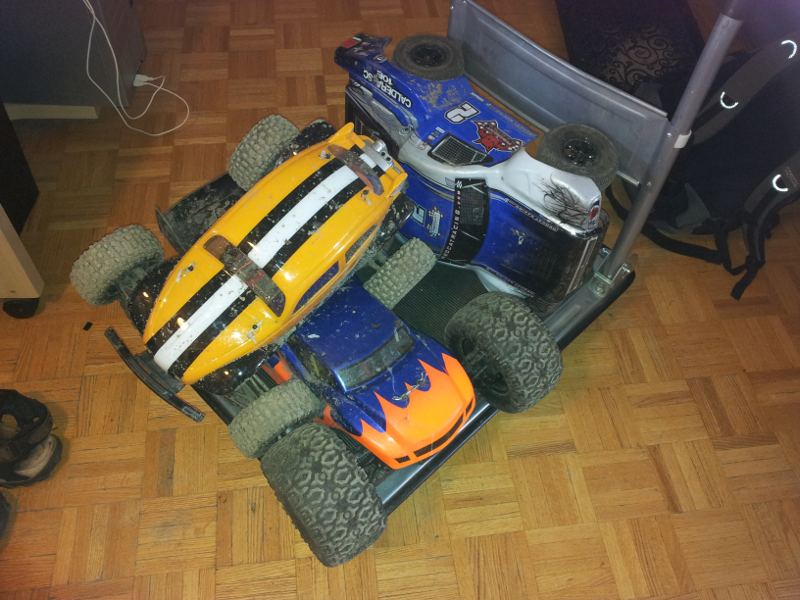 The most direct comparison with Traxxas would be to the Slash 4×4 VXL which comes to about $440 all-in. 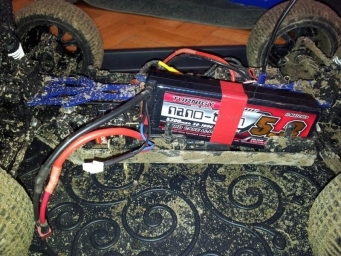 That’s at least $170 more: for that you get waterproof electrics, a more powerful motor+ESC, huge aftermarket support, the ability to buy parts in almost any hobby store, and moderate resale value. Well, for a RC novice looking for a small new truck, neither are great values. The best bang-per-buck models are brushed 2wd with AM/FM radios: something like the ECX Torment, Duratrax Evader ECX2, or Redcat Twister XTG. 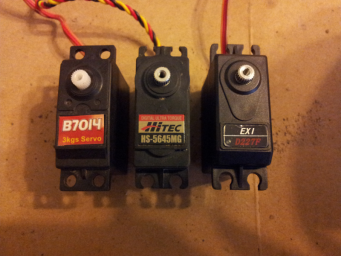 All three of those vehicles are close in price: about $50-$70 less than the Caldera SC 10E. Do I think an extra $50-$70 is worth it to step up to brushless electrics, 2.4GHz radio and 4wd? Absolutely! That bump in price is a steal for what you get in return… but for someone new who’s not sure if they’ll even be interested in RC next month… they’re better off pocketing that money… buying a slower old-tech truck… and keeping a small slush fund for parts until they know RC is a long-term hobby. So where does that leave the Caldera SC 10E? 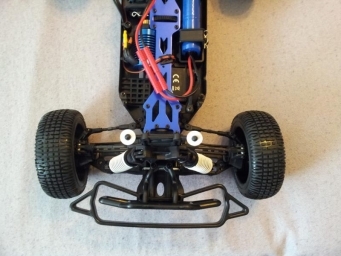 Not the perfect beginner RC (though it gives you a lot for your money), and not really something you would race because your local hobby store may not have parts in stock (though parts are cheap online). 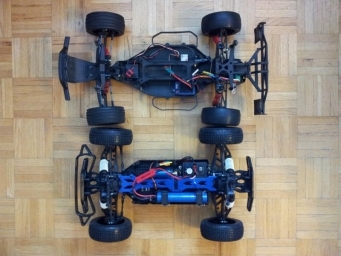 What I think it’s great for is a second or third RC: something with 4wd and brushless power for a more experienced driver… but cheap enough you don’t mind handing the transmitter to a friend so they can go try to wrap it around a tree. Exactly what I’m looking for: something to flog mercilessly knowing I have a backup car if I break it 🙂 – I’m going to turn mine into a bit of a project. – If I put Gorilla Tape on the inside of the bottom chassis holes and filled them flush with JB Weld, would it hold? The servo centers much better now, but there’s still too much free play in the steering. 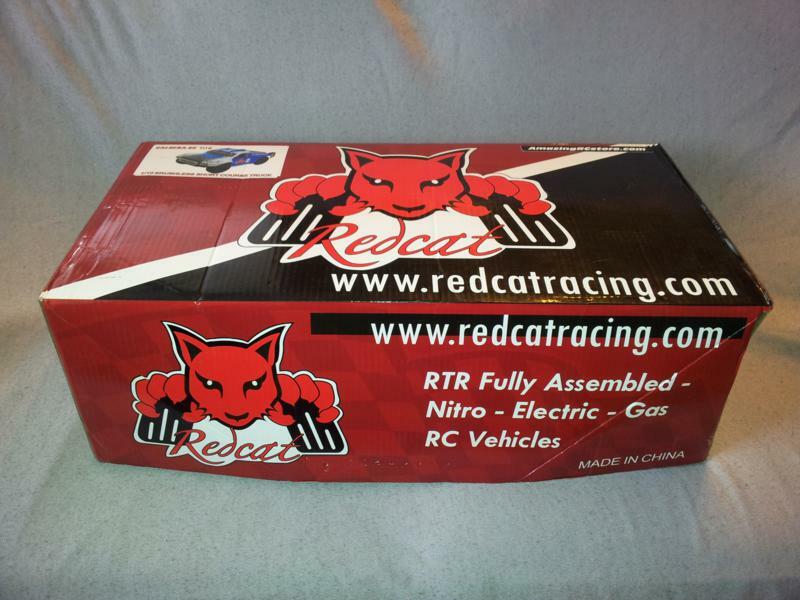 I tried ordering the metal steering rack… but it’s backordered from Redcat. For now I’ll shim the loose rack pivot arm (the one that’s not the servo saver) to make it a bit better. 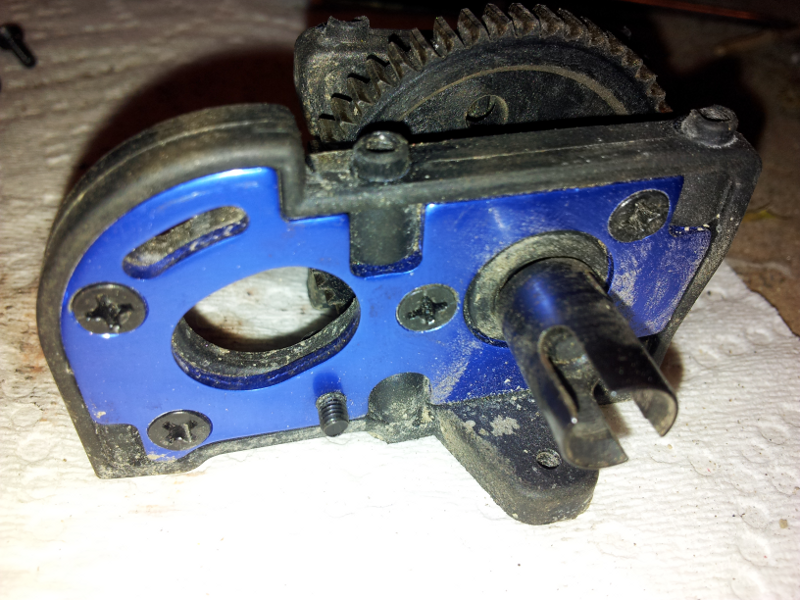 Next I may open the servo saver up to see if it can take a stiffer spring (i.e. from a RC10B4/SC10 rack). 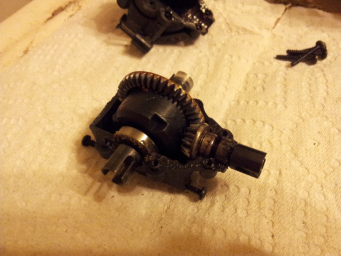 Soon enough I had the diff open: no silicon oil but lots of sticky red grease. I ended up filling the front diff with 10000wt and the rear with 7000wt. 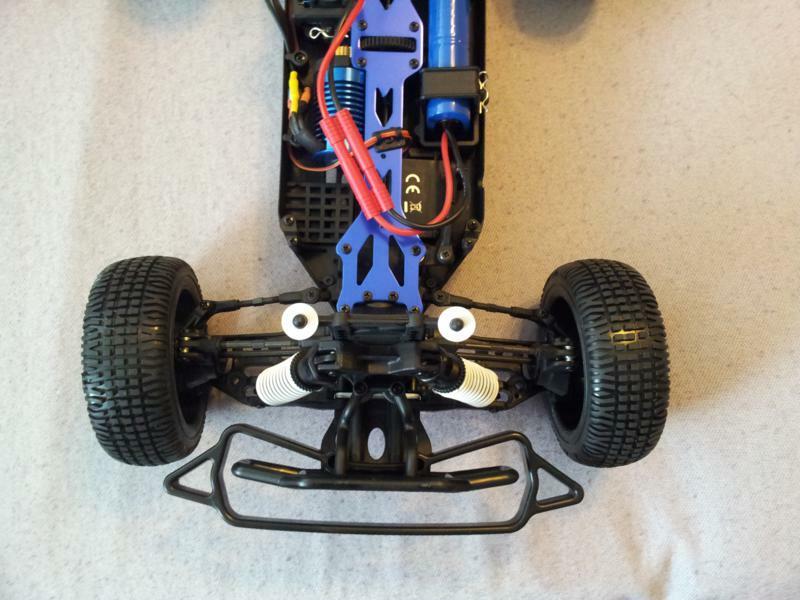 I also placed 2 Traxxas teflon 0.5mm shims behind the main drivecup and both sides that went out to the axles. Before the shimming you could press the cups inward and feel a grinding in the gears: now with the shims they can’t slide into the gearbox at all. I’m not sure if that will help gear life, but it made me feel better. General bashing is still fine, but I’m trying to tune it to accelerate straight when you punch it. Right now if you nail the throttle from mid-speed or a standstill the back end will come around immediately. I could see there was a gap behind the bushing… so I nudged it in deeper with the loving caress of a hammer.. but it’s still not perfect. I ordered some real bearings from RCMart.com… hopefully they fit. If the bottom one doesn’t go in all the way… I can try to put the saver in a vise and nibble another 1mm out of the bottom with a drill… but I’m not really equipped for precision drilling. I may just live with it. 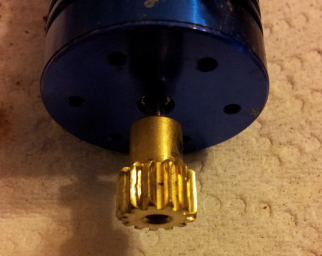 Next up was the pinion. After about 10-15 packs, mixed 6cell NiMH, 2s and 3s lipos the teeth on the stock 13-tooth 32-pitch brass one were worn razor thin. I bought a few cheap Traxxas steel pinions (15t is about max that will fit, maybe 16) and took everything apart to replace it. 13 screws take off the top plate, and 7 more come out to release the spur+motor mount from the bottom of the chassis. A nice surprise: the mount isn’t entirely plastic as it appears from the outside: it has a metal plate embedded – that should help keep the gear mesh perfect! I haven’t actually broken anything yet, but placed a parts order just in case. 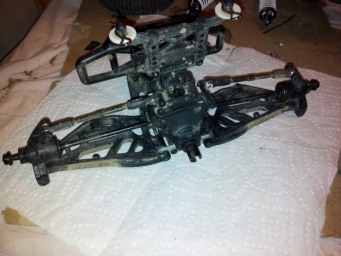 Redcat parts are cheap, even compared to the Associated and Traxxas bits I normally order. Based on the ROAR rules for SC trucks the Caldera SC 10E is a couple mm too wide (300mm vs. 296mm – narrower-offset rims would fix it), a bit too short (530mm vs. 540mm – a different body would fix this), but the wheelbase is 15mm too short (305mm vs. 320mm) (My SC10 just squeaks over the line at 327mm). Unless you extend the chassis another 1.5cm, or find front+rear A-arms that can sweep out another 8mm each… you can’t race this truck on tracks using ROAR rules. 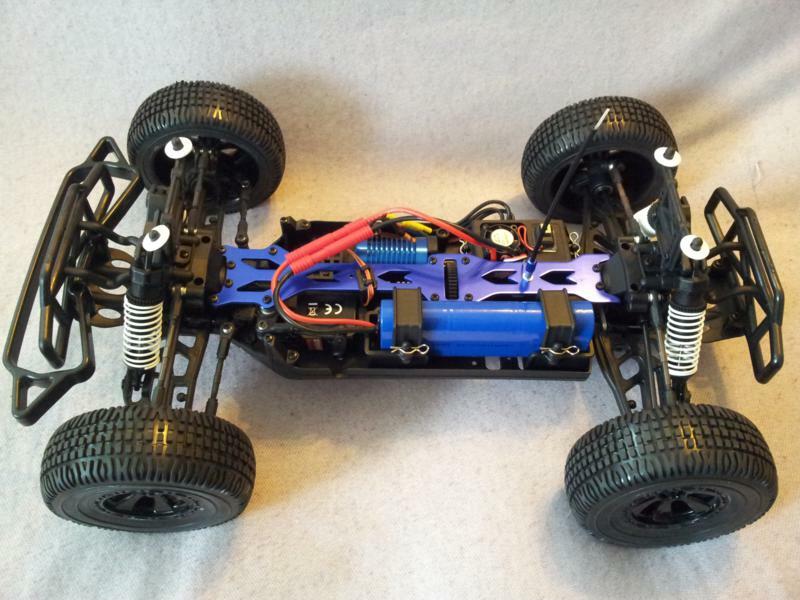 This entry was posted in Personal, Radio Control by Mike. Bookmark the permalink.